The eGenix.com pyOpenSSL Distribution is an easy-to-install version of the pyOpenSSL Python interface to the open-source OpenSSL library with support for Windows, Linux and Mac OS X. 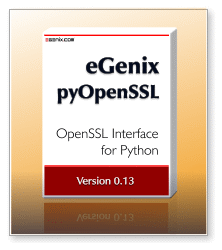 The eGenix.com pyOpenSSL Distribution includes everything you need to get started with OpenSSL in Python. It comes with an easy to use installer that includes the most recent OpenSSL library versions in pre-compiled form. pyOpenSSL is an open-source Python add-on that allows writing SSL-aware networking applications as as certificate management tools. It uses the OpenSSL library as performant and robust SSL engine. Our eGenix.com pyOpenSSL distribution is based on the last pyOpenSSL release 0.13 which was still using a custom OpenSSL Python wrapper written in C. Newer versions of pyOpenSSL have switched to a cffi based approach which requires additional support libraries. Please note that we sometimes add additional functionality to the pyOpenSSL package, which is only available in our distribution. See the documentation and change log for details. OpenSSL is an open-source implementation of the SSL protocol. Due to security breaches in OS-level OpenSSL library distributions (e.g. the Debian OpenSSL "fix") and the general problem of old OpenSSL libraries on systems, we have chosen to integrate the most current versions of the OpenSSL libraries directly with the package - on Windows and all supported Unix platforms, as well as Mac OS X. In previous releases, we also added the OpenSSL version number to the package version. Since causes very long version numbers, we have dropped the OpenSSL version starting with 0.13.5 and will only increase the main version number from now on. In the future, we plan to switch to a new version scheme that is compatible with our normal version number scheme for products. To avoid patent issues, we have excluded the following algorithms from OpenSSL via its config options: IDEA, MDC2 and RC5. We also removed the Kerberos5 support, since it's not needed for SSL-based communication, and SSLv2 support, since this protocol has been broken for years and should no longer be in use. In addition to OpenSSL library binaries, we always include the most recent certificate authority (CA) certificate bundles derived from the from Mozilla Firefox browser code base as CRT file with the distribution and also include a helper module OpenSSL.ca_bundle to easily access these embedded CA certificate lists for verification purposes. The CA bundles are updated with each new release of the eGenix pyOpenSSL distribution, but we also make them available as separate download. No External Dependencies: does not need or rely on system OpenSSL libraries. Supports Python 2.4 - 2.7. Available for Windows, Linux and Mac OS X with both 32- and 64-bit support. Free: to use and redistribute. The binary packages we provide for the various platforms include the pyOpenSSL modules as well as the OpenSSL libraries inside the OpenSSL Python package, so there's no need to download and install OpenSSL libraries separately. When using Python 2.5 or later, there are no additional requirements. Python 2.4 on Windows also works out of the box with the installers we provide. If you are using Python 2.4 on Unix, you additionally need the current eGenix.com mx Base Distribution installed (>= version 3.1.0), since this is needed to be able to load the shared OpenSSL libraries directly from the package directory. See the egenix_pyopenssl.py source code for details. The source distribution includes pre-compiled versions of the OpenSSL libs and header files for Windows - compiled with VC7.1 for Python 2.4 and 2.5 and VC9 for Python 2.6 and 2.7. Please see the openssl-win32/ and openssl-win64/ directories for details and the scripts we used to build those binaries. The eGenix.com pyOpenSSL Distribution itself is made available under the terms & conditions of our eGenix.com Public License Agreement 1.1.0 which is an Open Source license based on the CNRI Python license. Please see our eGenix.com Third-Party License Guide 2.0 for details or check the source code distribution which comes with all licenses and disclaimers. The manual includes pointers to the OpenSSL, the pyOpenSSL API documentation, as well as the eGenix additions to pyOpenSSL and notes relevant to using the package in applications. All APIs live in the top-level OpenSSL Python package. First, please identify which Python version you have installed and whether you need a UCS2 or UCS4 build (see below for how this can be done). We have setup the default selections below to what you normally need for the platform's default Python installations. If you are using Python 2.4 on Unix, you also need to install the current eGenix.com mx Base Distribution (>= version 3.1.0). This is not needed for Python 2.5 or later versions. Since the eGenix.com pyOpenSSL Distribution contains cryptographic code, you will be asked to confirm to comply to the German and EU export regulations (which are based on of the Wassenaar Arrangement). Please make sure that downloading and using cryptography is legal in your country. After successful download, please head on to the installation instructions below. By downloading, installing or using the eGenix.com pyOpenSSL Distribution, you agree to the terms and conditions set forth in the eGenix.com Public License Agreement 1.1.0 as well as the pyOpenSSL and OpenSSL license (see our eGenix.com Third-Party License Guide 1.0). Note: Even though the files for Python 2.4 are named "...Power_Macintosh..." or "...ppc...", they still contain universal binaries. The name is due to a bug in distutils for Python 2.4. If you want to use easy_install / setuptools / pip for installation, you can also use our egg builds of the packages. Please see the egg installation instructions below for details. On Unix it is important to know whether you need to download a distribution for a narrow Unicode build of Python (UCS2) or a wide version (UCS4). The eGenix pyOpenSSL Distribution can be installed using multiple way. This section goes into detail regarding the various possible approaches. The web installer is available for download on the product's Python Package Index (PyPI) page. Installation tools will automatically pick up this installer when used without any extra options or URLs. The web installer will then determine the installation platform, select the right binary download package and install the corresponding prebuilt archive for you. If the web installer fails to find a suitable binary, please try one of the other methods explained below and report the problem to our support team. Note that when using Python 2.4 on Unix, you will also need to install the eGenix.com mx Base Distribution before proceeding with the following steps as explained in the download section. Since the eGenix.com pyOpenSSL Distribution contains cryptographic code, you will need to comply to the German and EU export regulations for such code (which are based on of the Wassenaar Arrangement). Please make sure that downloading and using cryptography is legal in your country. The web installer will ask you to confirm that you have read, understood and agree to comply to the terms outlined on our crypto download page prior to starting the download of the prebuilt archive for your installation platform (which are hosted on our servers in Germany). The installer package itself does not contain any cryptography code, so export regulations do not apply to the download from PyPI (which is hosted in the US and elsewhere). via a --crypto-confirm command line switch, which you can pass to python setup.py install, e.g. via setting an environment variable EGENIX_CRYPTO_CONFIRM to the value "ok", which is useful for installers such as pip and easy_install, which indirectly call the web installer, e.g. If you prefer to use easy_install or another egg-file based installer such as zc.buildout for your Python packages, you can also download the egg distributions we make available for the package and install those. The egg archives we provide are made available through two PyPI-style indexes which the egg tools setuptools/easy_install/pip/zc.buildout can access to automatically download and install the right egg archive. By downloading the egg distributions for the eGenix.com pyOpenSSL Distribution you confirm that you have read, understood and agree to comply to the terms outlined on our crypto download page. The command line parameters for other tools such as pip are similar. Please consult their documentation for details. Please consult the easy_install documentation for details on how to uninstall egg files.